5/18/2007Share this story on Facebook! 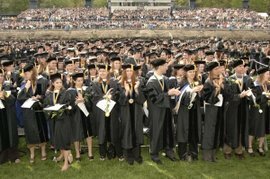 Sunday May 20, 2007 marks the 112th Commencement Ceremony at Ithaca College. The commencement speaker this year is former executive director of Amnesty International, Dr. William F. Schultz. Dr. Schultz held the position from 1994-2006, during which he led missions to Liberia, Tunisia, Northern Ireland, and Sudan. We at Fuse would like to congratulate all graduating seniors and extend special congratulations to our own two graduating staffers, Bryan Roth and Rachel Barker. Thanks for all your hard work. Good luck in the "real world!"